Gold futures drifted around the unchanged mark early Thursday, tracking a little-changed dollar index and firmer stock indicators that hinted equities markets would bounce back from the Dow’s 138-point drop a day earlier. December gold GCZ7, -0.05% fell about 10 cents, or less than 0.01%, to $1,277.60 an ounce and has twitched across positive and negative territory. 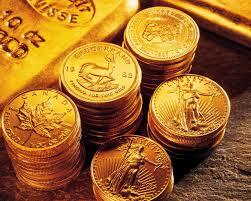 The exchange-traded SPDR Gold Trust GLD, -0.12% was little changed in premarket trading. Gold reversed early gains to end lower Wednesday, the first close in the red in three sessions. The yellow metal remains strongly influenced by interest rates and returns on other assets, as rising rates expose the opportunity cost of holding non-yielding bullion. The dollar in the previous session recouped much of its earlier weakness amid ongoing concerns over the progress of a U.S. tax overhaul and the latest data on U.S. inflation. And early Thursday, the ICE U.S. Dollar Index DXY, +0.07% which measures the buck against six rivals, traded at 93.95, up less than 0.1%. Gold and the dollar often move inversely as moves in the currency can raise or lower gold’s appeal to investors using other currencies. A busy day for data releases and Federal Reserve speakers could shed light on the odds for interest-rate hikes beyond the widely expected December increase. A report on weekly jobless claims is slated to hit at 8:30 a.m. Eastern Time. Data on import prices in October and the Philadelphia Fed’s business-outlook survey for November are due at the same time. October figures for industrial production are scheduled to arrive at 9:15 a.m. Eastern, with 0.6% growth forecast for the headline number. Then a November reading on the housing market is on tap at 10 a.m. Eastern. On the Fed front, Cleveland Fed President Loretta Mester is due to give a speech at the libertarian Cato Institute in Washington, D.C., at 9:10 a.m. Eastern Time. Also speaking Thursday: Dallas Fed President Rob Kaplan, Fed Gov. Lael Brainard and San Francisco Fed President John Williams. On the supply side, a note from BMI Research said analysts expected China’s gold production growth to slow over the years to 2026, on the back of depleting reserves and rising production costs. “Undervalued overseas companies faced with debt and credit crunches will incentivise more overseas investment by Chinese gold miners,” BMI Research added. In other metals trading, December silver SIZ7, +0.35% was up 6 cents, or 0.4%, to $17.035 an ounce. The exchange-traded iShares Silver Trust SLV, -0.31% slipped 0.3%, however. December palladium PAZ7, +0.18% gained 0.2% to $987.45 an ounce, after settling earlier this month at $1,015.85—the highest since February 2001. January platinum PLF8, -0.06% fell less than 0.1% to $932.50 an ounce. December copper prices HGZ7, +0.36% gained 0.4% to $3.0675 a pound.